I didn't think the back of the book made this one sound all the interesting, to be honest, but man was I mistaken! The book opens with 4 boys visiting a witch. I was intrigued. Next up is a forced marriage. I was interested. Then the 4 heroes of the series were captured. I was hooked. What can I say? 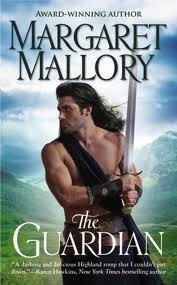 I'm a sucker for a good Highlander book-they don't call me the Highland Hussy for nothing! In a mistaken circumstance, Ian is forced to wed 13 yr old Sileas (this is the 1500s, so that's not as bad as it sounds, plus Ian is like 17). For Sileas, not only is Ian the one she's wanted since she could toddle after him, he has been her protector, her savior, her guardian in all things. But this was not how she wanted him. The forced wedding is awful. Not only is it Sileas' worst day of her life, but Ian is forced at knife-point to say his vows. The morning after the wedding, he bails. Ian and his 4 best buds go off to France and he tries his best to ever forget he was married. The only reason he comes back at all is that his clan is attacked and his father gravely injured. He and his friends Connor, Duncan, and Alex are inseparable, so they all return. Ian's plan is to annul the marriage to his child-bride...but he not once ever thought that she might have grown up. His child-bride is no longer a child. With one look at Sileas, Ian is a goner...but he doesn't recognize his wife in the sultry young redhead. When he finally does, she has run off because not only did Ian snub her at their wedding, he snubbed her the day after by leaving, and every day since in not coming home. To not even acknowledge his wife in front of the clan? Major faux pas. "You are mine, he said pausing to look at her with burning eyes. "And I'm claiming every inch of ye." "When she was a wee thing, she trusted him to rescue her from mishaps. And now that she was a woman, she trusted him with her heart. He would do his best to deserve it, now and always." I have a feeling that all of the politics involved in this book are super important for the series. Everything from Connor's chieftainship, to Knock Castle. There was a visit to Stirling where Sileas tried to get the queen to annul her marriage-what a scary place, Court, I mean. All the backstabbing and awful awful things going on...I was very satisfied with how that turned out, but I know that Douglas will play an important part in the series-he's too evil and wily to just fade away. The ending and all of the events leading up to it were tied in together so neatly (but not too nice and neat, otherwise there wouldn't be a series!) and made me feel that Ian had redeemed himself for leaving Sileas and his clan. Final verdict? I have 2 of Margaret Mallory's books on my nightstand and I am seriously wondering why I've never read them? I will be reading her backlist this week. Sign into Goodreads to see if any of your friends have read The Guardian. 3.95% "So good. So so good!" 20.0% "Oh I like Sileas, I like her alot." 35.0% "I'm an idiot for not having read this author sooner"
50.0% "Oh NO OH NO OH NO!" 75.0% "Oh for the love of...would everyone please stop interrupting them?" 75.0% ""You are mine, he said pausing to look at her with burning eyes. "And I'm claiming every inch of ye."" 75.0% ""When she was a wee thing, she trusted him to rescue her from mishaps. And now that she was a woman, she trusted him with her heart. He would do his best to deserve it, now and always."" Can't wait to see what you think of this one Laura. Hope it's good. My husband know better than to do that! That would set off a rumble! I did buy a book light as a courtesy to his beauty sleep though. maybe that's my next investment! I get that it was midnight, and that he was tired, but I'm still the one who got up when our 3 yr old had nightmares and sleepwalked. I'm the one who got the kids up and ready for swimming lessons at 8frickin'AM today...shouldn't I at least be able to finish the chapter? I'm "liking" your review early just because I can't wait to get this book. I'm just craving some highlanders! Laura 'Highland Hussy' wrote: "I get that it was midnight, and that he was tired, but I'm still the one who got up when our 3 yr old had nightmares and sleepwalked. I'm the one who got the kids up and ready for swimming lessons at 8frickin'AM today...shouldn't I at least be able to finish the chapter?" Huh, story of my life! All I can hear is snoring from him when our 4 yr old is yelling "daddy". Yeah, right. Daddy. Laura 'Highland Hussy' wrote: "maybe that's my next investment! I get that it was midnight, and that he was tired, but I'm still the one who got up when our 3 yr old had nightmares and sleepwalked. I'm the one who got the kids..."
Last time my hubby tried to turn out the lights on me, I acted all surpised and mentioned he must be getting his sleep early so he could take the kids to school. That stopped him in his tracks real quick! Oh Michelle, I like that trick. What an excellent idea! Jen wrote: "Oh Michelle, I like that trick. What an excellent idea!" Michelle wrote: "Laura 'Highland Hussy' wrote: "maybe that's my next investment! I get that it was midnight, and that he was tired, but I'm still the one who got up when our 3 yr old had nightmares and sleepwal..."
Great review! You know I loved it and can't wait for more! Great review! This was on my "get from the library sometime" list, but I think it needs to be upgrades to "must buy asap!" can't wait to read it, but it's released in england next month so unfortunately am gonna hafta wait! I can't wait to see what you think, Catherine! Anna, that stinks! can you get ebooks now? or do those release alter as well? Linda wrote: "Great review! F"
Thanks! A few of my friends didn't like the hero, but I thought he redeemed himself. You'll have to let me know if you read it!